With 2016-2017 Golden Decade Book Signing Events and Exhibits at the famous Strand bookstore in New York City, Smith Andersen North Gallery in Marin County, Laguna Art Museum, Minnesota Street Project in San Francisco by Casemore and Kirkeby, the San Francisco Art Institute and the Bankhead Theater Gallery at the Livermore Valley Performing Arts Center, the Steidl book redesign of The Golden Decade: Photography at the California School of Fine Arts 1945-1955 has sold out the first print run of 2,400 and will go into a second printing. After New York, the Golden Decade came home to San Francisco, which was made possible through the City’s newest, most innovative contemporary art complex at the Minnesota Street Project. At the Minnesota Street Project, museum installation expert and gallerist Stefan Kirkeby of Smith Andersen North Gallery had co-founded the Casemore Kirkeby Gallery for contemporary photography with Julie Casemore. Soon after, Stefan Kirkeby having hosted Golden Decade shows at Smith Andersen North Gallery, helped Ken and Victoria Whyte Ball arrange for a special Golden Decade exhibition in its own separate space at the Minnesota Street Project. Interest in the Golden Decade has remained high ever since the first contemporary group show in 2010, when a self-published version of the book came out. For more about the overwhelming success of that first show of the new millennium, see the blog post, “Over 500 People Attend the Golden Decade Show.” Stay tuned for announcements about new exhibitions currently in the works for upcoming years. George Eastman, founder of the Eastman Kodak Company, popularized photography and earned two stars on the Hollywood Walk of Fame for the invention of roll film. Eastman also invented the roll film holder, developed the dry plate technology that simplified the mechanics of photography and created bromide paper, which became a standard in the industry. Eastman’s transparent film enabled Thomas Edison to perfect the kinetoscope, the forerunner of the motion picture. Eastman established a $200,000,000 industry and devoted most of his life to philanthropy. His gifts made the University of Rochester and MIT into first tier schools. His donations were the largest of the 1920s in support of the education of African-Americans. He established dental clinics for children around the globe and founded the medical and dental school at the University of Rochester. He organized community music instruction and concerts. He built the Eastman Theater, still one of the most eloquent concert halls in the U.S.
After his death, the state of New York converted the George Eastman House into the second museum in the world to exhibit photography after the Museum of Modern Art in New York City. The George Eastman Museum was also the second museum in the world to collect and archive motion pictures. The George Eastman Museum has developed one of the world’s largest photography collections with a total of several million objects, including over 450,000 photographs from the beginnings of the medium in 1839 to the present. The collection also includes more than 28,000 motion pictures, one of the leading libraries of cinema and photography books, as well as an extensive archive of George Eastman’s documents and memorabilia. Each year now the museum presents at least ten curated exhibitions. However, in the early days of the museum exhibitions were much less frequent. While Beaumont Newhall was head curator and Minor White was an assistant curator in 1957 the George Eastman Museum hosted a solo exhibition of 25 black and white prints by Philip Hyde. George Eastman Museum purchased three of Hyde’s silver gelatin prints for its permanent collection. In 2010, David Leland Hyde, Philip Hyde’s son and executor of his estate, contacted the previous curator of the George Eastman Museum to inquire as to the status of the three black and white prints in the museum collection and gather more information from the museum records about the 1957 show. The museum did not have the prints on display or online, but they did exist in the archives. Now in 2016, to celebrate the 100th Anniversary of the National Park Service, the George Eastman Museum is hosting an exhibition called Photography and America’s National Parks that includes the photography of the early pioneers, the famous modernists and many contemporary photographers. For a list of all of the photographers in the show see Philip Hyde in Photography and America’s National Parks Exhibition at the George Eastman Museum. To compliment the show, the museum has co-published with Aperture, Picturing America’s National Parks with introductory essay by curator Jamie M. Allen. 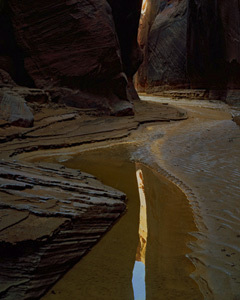 David Leland Hyde wrote about the exhibition for the June Special National Parks Issue of Outdoor Photographer magazine. David Leland Hyde also wrote a special feature article about Philip Hyde’s role in the conservation campaigns that helped make more national parks and wilderness than any other photographer. Pick up a copy soon as special issues of Outdoor Photographer are known to sell out. A special preview party for the Photography and America’s National Parks exhibition will be held at the museum on Friday, June 3, from 7 to 9 p.m. Curator Jamie M. Allen will provide an overview of the exhibition, and guests will enjoy access to the galleries, cash bar, light refreshments, and live music. Free to museum members. Tickets: $15, $10 for students with student ID. Reservations are encouraged at (585) 234-6064. The museum is offering a variety of lectures. Topics include a travelogue of Yellowstone, the history of Kodak Picture Spots, and how the staff prepared the works for display in the exhibition. Talks by photographers John Pfahl, Willie Osterman, and Sean McFarland offer the opportunity to learn about the works on view from the artists themselves. All of these programs are free to members and included with museum admission. Saturday, June 4, 2 p.m. Artist’s Talk: John Pfahl Buffalo-based photographer John Pfahl explores our relationship to the landscape as framed with the photographic lens. Book signing to follow. Generously sponsored by Dawn Lipson. Saturday, July 9, 2 p.m. Wish You Were Here—Special Edition: Yellowstone Travelogue with Tom Tischer Wish You Were Here photography lecture series sponsor Tom Tischer will share a slideshow of photographs from his travels to Yellowstone National Park. Saturday, July 23, 12 p.m. Focus 45: Framing America’s National Parks Emily Phoenix, the museum’s chief object preparator, will discuss framing photographic objects in Photography and America’s National Parks. Thursday, August 25, 4 p.m. Artist’s Talk: Willie Osterman Willie Osterman, photographer and professor in the photographic arts department at RIT, will join associate curator Jamie M. Allen for a gallery talk about his work. Generously sponsored by Dawn Lipson. Saturday, August 27, 12 p.m. Focus 45: Kodak Picture Spots and the Perfect Picture Leslie K. Brown will discuss the history of these iconic signs, from their use as roadside markers in the 1920s to their installation in national parks, world’s fairs, and theme parks. Thursday, September 22, 6 p.m. Wish You Were Here: Sean McFarland Sean McFarland will discuss his work, which explores the relationships between history, photography, and the representation of landscape. Exhibitions open until 8 p.m. Free for students w/ ID. Generously sponsored by museum member Thomas N. Tischer. Sunday, July 31, 2 p.m. Music in the American Wild This new music initiative honors the centennial of the National Park Service. Seven performers and eleven composers—all affiliated with Eastman School of Music—have come together to bring works inspired by the national parks to communities across the country. Under the leadership of flutist Emlyn Johnson, Music in the American Wild will premiere these works on a summer 2016 tour including performances at Mammoth Cave, Great Smoky Mountains, Shenandoah, and Mount Rainier National Parks, as well as the Smithsonian American Art Museum (Washington DC) and the Eastman Museum. FREE admission to concert. Museum admission on July 31: $10 (adults & seniors). Throughout July and August, the Dryden Theatre is screening films shot in national parks and national forests. Widely diverse stylistically and thematically—from Howard Hawks’s The Big Sky to Spielberg’s Close Encounters of the Third Kind—the ten films in the series celebrate the beauty and the wildness of these lands which refuse to be tamed even by the mighty hands of Hollywood. Tickets: $8 general, $6 members, $4 students. * Dryden Kids screenings free for 17 & under. Published in partnership with Aperture, this book traces the relationship between photography and the national parks and features stunning photographs of America’s most beloved landscapes. An informative essay from exhibition curator Jamie M. Allen describes the role of photography in promoting America’s national heritage, land conservation, and wildlife preservation. This book is available for $50 ($45 members) in the Eastman Museum Store or online at eastman.org/store. On recommendation by gallerist and museum exhibition installer Stefan Kirkeby, Ramekon O’Arwisters, curator of exhibitions at the SFO Museum, San Francisco International Airport, invited me to help him curate an exhibition of photographs by my father, American wilderness photographer Philip Hyde. The SFO Museum is the only accredited museum in an airport. The museum puts on over 40 shows a year in the four airport terminals at SFO. Lorraine Anne Davis MA, MFA, a fine art photography appraiser doing business as Archive & Collection Management, LLC, with offices in Los Angeles, Santa Fe, Houston and New York has been appraising photographs and photography collections since 1984. She writes feature articles and two regular columns on appraising photographs for Black and White Magazine: For Collectors of Fine Art Photography and has contributed to many academic publications. She studied under Amy Conger, PhD and Peter Bunnell at Princeton. She printed for the Chicago Albumen Works and worked as Bernice Abbott’s printer and archivist. She also was the assistant director of the Paul Strand Archive, a curator for Galerie zur Stockeregg in Zurich, Switzerland and the Pfeifer Collection also in Zurich. She is a fully Accredited Specialist of Photography in the Appraisers Association of America and carries a Uniform Standards of Professional Appraisal Practice (USPAP) certificate as set by the Appraisal Foundation in Washington, D.C. She has signed and adheres to the AAA’s Code of Ethics. She is available for lectures and workshops on appraising, preservation of photographs and collection management for collectors and institutions. In the April 2009, Issue 66 of Black and White Magazine, Lorraine Anne Davis wrote an article for her column titled, “Concerning Digital Reprints.” In the article, Davis wrote that there is no longer any argument against the legitimacy of digital prints in general, but there is still a question regarding digital “’reprints’ by photographer’s estates or of public domain images whose negatives were created to be rendered in traditional analog processes.” She mentioned that Imogen Cunningham’s Estate, the Ansel Adams Gallery and Edward S. Curtis’ public domain image printers were producing digital prints. She made the argument that these digital prints were not only of little value themselves, but that they were undermining the value of the “original” hand-made prints by the artists themselves. While I have much respect for Davis and for those who admire her, which are numerous in the industry, not to mention that she has been helpful to me; in this case, based on considerable evidence, I disagree with part of what she wrote and agree with part of it too. In the case of the Ansel Adams Trust, the production and sales of their “digital replicas” that are high quality digital photographs of Ansel Adams’ prints, have had zero negative impact on the value of Ansel Adams’ hand-made darkroom silver gelatin prints. In fact, the digital prints and their promotion has brought more attention to Ansel Adams’ work and allowed for a wider economic diversity of buyers and gallery patrons. Since it is difficult to find some Ansel Adams prints, the digital prints also make more of the images readily available. …In the case of Edward Curtis’ “original” digital prints, made from scans of original photogravures, there are so many vintage, original photogravures available of his work that to purchase a digital facsimile is similar to purchasing a facsimile of the American Constitution when one visits Philadelphia as a tourist. The facsimiles produced for wall decoration might be pleasant enough, but anyone who collects photographs, even on a small scale, can for the same amount of money buy an original work of art. In other words, Edward S. Curtis’ vintage photogravures are already so common and worth so little that digital prints were equal to them in value when they were first issued. In this case, obviously the digital prints do not devalue the “original” prints. If anything, the issue of the digital prints may spark more sales of the photogravures. How Are Digital Prints Valued? Are They Collectible? The value of a photographic print is affected by the type of print it is, whether it is an “original” executed directly by the artist, or under the artist’s supervision, or it is one, two or more generations removed from the original. One evening at an opening at Smith Andersen North Gallery, Stefan Kirkeby introduced me to a collector interested in vintage black and white prints from photographers like my father who were students of Ansel Adams and Minor White in the first 10 years, now called the Golden Decade, of the revolutionary professional creative photography program at the California School of Fine Arts, now the San Francisco Art Institute. This collector said that he did have digital prints in his collection, but that he did not want digital prints of that era. I don’t blame him for not wanting digital prints from that era when he could afford vintage darkroom silver prints. However, what he did not realize is that unlike many of the other Golden Decade photographers, my father, pioneer landscape photographer Philip Hyde’s renown was not limited only to the time period when he was making black and white prints as an apprentice to Ansel Adams and Minor White. Ansel Adams had more students than any other photographer in history. Yet Dad is known for being one of only three of Ansel Adams’ thousands of students who Ansel Adams invited to teach side-by-side with him in his Ansel Adams Workshops in Yosemite Valley. Dad is also known for participating in more environmental campaigns than any other photographer, making many national parks and more wilderness than any other photographer, being the primary contributor to the Sierra Club Exhibit Format Series that popularized the coffee table photography book, and perhaps most pertinent to this discussion, Dad is known, along with Eliot Porter for having introduced color to landscape photography. Most of the archival lightjet and digital prints we make are of the most prominent color images that are nearly out of stock or sold out now because Dad made so few dye transfer and Cibachrome prints of them to begin with. He made in nearly all cases only 2-8 prints of each image. The other archival lightjet and digital prints we make are of Dad’s damaged or age-faded original color film transparencies. A relatively few of our digital prints are made from the black and white negatives, in fact nearly all of the black and white digital prints are made from scans not of the negatives, but of Dad’s prints. I would not suggest to the collector to acquire archival lightjet or digital prints instead of vintage prints, but rather to consider them whenever the “original” color prints are no longer available. For the lovers of darkroom silver gelatin prints, we plan to come out with modern black and white prints of some of Dad’s photographs too, those of which we have no more prints available. Our color archival lightjet and digital prints are made by master landscape photographer Carr Clifton, who has been a photographer now for more than 35 years and a digital printer for over 15 years. His mother introduced him to my father when he was a young teenager before he even had a camera. He had made a number of home movies but told his mother that he thought he would rather be a still nature photographer. He received advice on a starter camera, photography school and other aspects of getting started from Dad and this began a life-long mentor relationship and friendship. The Sierra Club’s printer, Barnes Press, in 1966 had damaged two of Dad’s original color film transparencies from the Exhibit Format Series Book, Navajo Wildlands. Someone at Barnes Press had mishandled the transparencies with their bare hands and put fingerprints in the sky of the photographs, “Horse at the Mouth of Canyon de Chelly” and “Stormlight, Canyon de Chelly,” two of Dad’s most important images. Starting in 1998, using Photoshop, Carr Clifton restored the sky and removed the fingerprints. He then made large, detailed, sharp as any ever, digital prints of the two photographs. My father was blown away. Marveling at the new technology, he authorized Carr Clifton to print digital prints eight years before his death in 2006 and two years before he lost his eyesight in 2000. Dad even signed at least five, maybe a few more of the digital prints. Since they were authorized and overseen by Dad, just as Lorraine Anne Davis mentioned in her article, our archival lightjet and digital prints cannot be considered posthumous prints, but have collector value as photographer authorized prints. Having Carr Clifton and myself printing my father’s photographs is comparable to the printing of Edward Weston’s prints by Brett Weston and Cole Weston. When a picture is skillfully made drawing or painting, its meaning surely derives to a huge degree from the intention of its maker. But when a picture is a reproduction of a drawing or a painting, the case is very different, because the form and therefore the meaning of this second generation picture are then heavily influenced by the technology used to produce the reproduction… When the picture-making system is photography, though, everything becomes muddled, because even in original work—photographs taken out in the world—the mind of the maker has to share the driver’s seat with the form of the picture as it is shaped by the technology of photography. And when a photograph is reproduced, things get more difficult, because such reproductions can only be made by re-photographing the photograph. It then becomes very hard to tell whether the person doing the reproduction or the technology itself might be in charge. As an appraiser, I feel it is safe to say that high-end, artist-made or controlled reproductions will maintain their relative value as compared to the originals. However, one should be aware that when purchasing reproductions of a photograph, no matter what technology was used, that the intent will influence the value. Photographs by Wynn Bullock, Philip Hyde, Robert Glenn Ketchum, Bob Kolbrenner, Al Weber, Peter Essick, Tom Murphy and Robert Weingarten, and sculpture by David Hayes. Dogwood, Sequoia Redwood Trees, Sequoia National Park, Sierra Nevada, California, copyright 1974 by Philip Hyde. An archival digital print of this photograph will hang with three other Philip Hyde prints in the group show.